In this tutorial for JungleDocs for Office 365, you will learn how to configure Word Templates for use with Small Parts. Important: before you proceed, make sure you have created a Small Parts library. JungleDocs needs to know where exactly to place your Small Parts from your Small Parts library in your document template. To let JungleDocs fill documents correctly, you will add content controls to your template. 1. Open the document template you want to add Small Parts to. Do this via a specific rule, or create a new document template. 2. Locate the specific point in your document where you want your Small Part to be inserted and add a Rich Text Content Control. 3. Select your content control and click on Properties. 4. Now you can add a link from the content control to your Small Parts library. If you want to link to company information in your Small Parts library, you would enter 'Small Part: Company' in the tag field. 5. 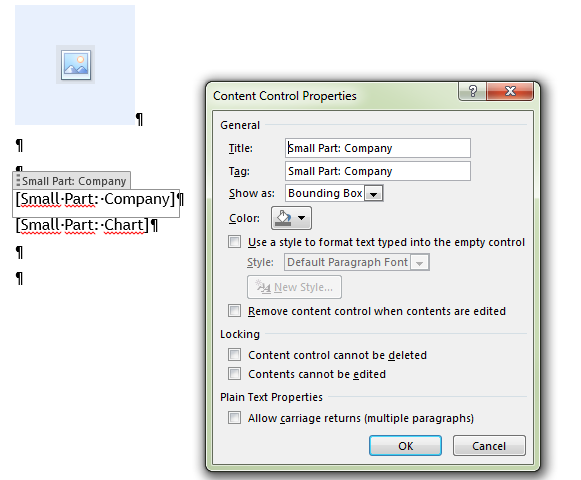 Once you have added all content controls to your document template you can save it and add it to your JungleDocs rule. 6. Make sure to assign the Small Parts library to your JungleDocs rule. 7. When you next run your JungleDocs rule it will show the Small Parts as checkboxes. When you check them this will add the Small Parts to your document.